This vegan “pulled pork” BBQ recipe will trick even the most pesky meat eaters, I promise. You can eat this on anything: tacos, nachos, burgers, or even as a dip! Combine all ingredients except the jackfruit into a medium sized bowl. Mix well until you get a super smooth consistency. Taste and check to see if you want it sweeter, saltier, or spicier. Make it your own! Add sauce and jackfruit to pressure cooker and cook on high for 25 minutes. Tear apart with two forks, remove from pressure cooker, and let cool. Serve on tacos, nachos, burgers - get creative! I mean… who isn’t obsessed with nachos? This is the ultimate party dish. 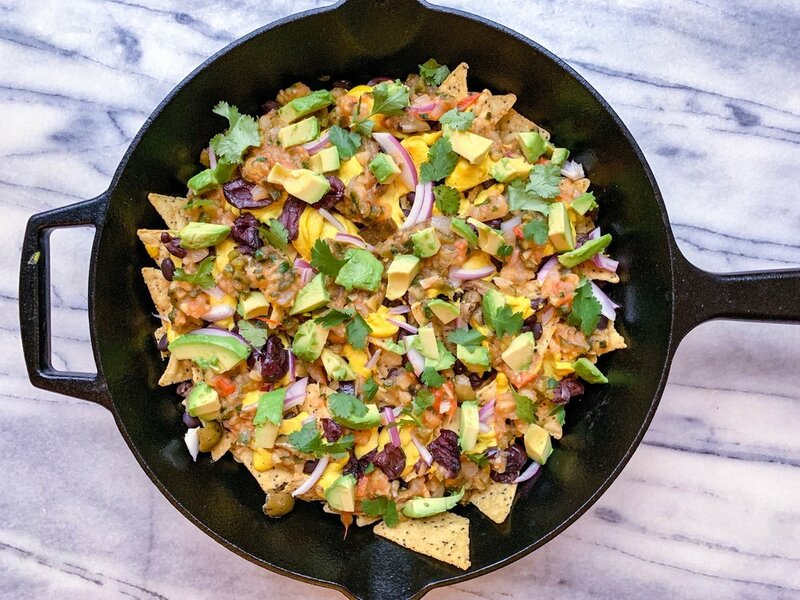 Now with this vegan recipe, you can eat superfoods and get your nacho on too! Place all ingredients except mango and cilantro into baking sheet and drizzle with avocado oil. Bake for 10-15 minutes until peppers and onions are browning. Pull out of oven and let cool for about 5 minutes. Scoop cooked veggies into blender with mango and cilantro. Pulse until everything is combined. Refrigerate and ideally let sit overnight before enjoying. Note: keep salsa separate from nachos until you are ready to eat! Layer chips, black beans, cheese sauce, olives, onion, and avocado in a cast iron pan. Bake for 10-15 minutes until hot. Top with salsa, avocado, and cilantro. Serve immediately! There are so many amazing things about this recipe that I wasn’t totally sure what to even call it. We’ve got veggies, protein, chocolate, bananas and a blender to do all the work for you! This is my GO-TO muffin recipe. I tweak it here and there to satisfy my flavor cravings but the base has been the same for years. If you are an OG follower, you’ve seen these before and we all know how hooked you are on them. This is my new little vegan twist, with a little extra calories from the oats to keep you satisfied for longer. Eat one, or two, or five. Just don’t take your eyes off them for too long or they’ll disappear. Best kept in the fridge and eaten cold, trust me in this one! Line a muffin pan with parchment cupcake sheets. In a high powered blender, add the oats. Blend on high until the oats are a flour like consistency. Then add everything else besides 1/2 the chocolate chips and the walnuts. Blend for about 2 minutes until the batter is super smooth. Pour into muffin cups 3/4 way full and top with the rest of the chocolate and walnuts. Bake for 20-25 minutes or until the muffins bounce back when you touch them. Let them cool completely and store in the fridge!